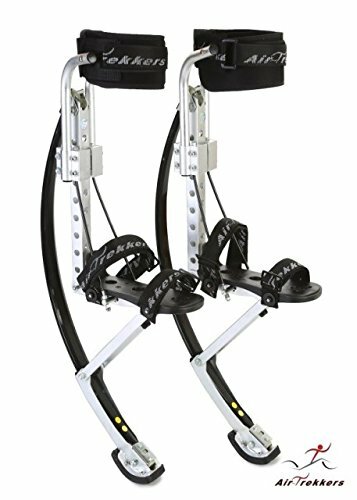 ADULT JUMPING STILTS by AIR TREKKERS BW EXTREME 1 Pair of Spring Loaded JUMP STILTS are Cool Gifts for Men Flips, Tricks, Exercise, Fitness, Cardio BOUNCE SHOES with PROTECTION PADS & KNEE SUPPORT by Air-Trekkers at Scruffs Game. MPN: EXTREME-BW-S. Hurry! Limited time offer. Offer valid only while supplies last. Run Faster, Jump Higher with bionic-like power: Anywhere, Any Age. Literally one of the coolest pieces of sporting equipment available to mankind! Run Faster, Jump Higher with bionic-like power: Anywhere, Any Age. Literally one of the coolest pieces of sporting equipment available to mankind! The lightest, most advanced jumping stilts on the planet: Our newest generation jumping stilt, the BW-EXTREME. Run over 20 miles per hour. Jump up to 3-5 meters high. The "Best of Line" EXTREME Model is ideal for high performance acrobatic use or for any type of outdoor fitness and exercise. These German engineered, USA patent protected, spring stilts have several weight categories so any size person may use. 1 year warranty on defective parts. 30 day full return for all “unused” product. With input from our commercial stilt performers, The BW-EXTREME has newly designed Calf Cuffs for ease of fit and exceptional comfort. New, extra-wide strap bindings, (2x wider than any other jumping stilt), are safe and simple to tighten. Our carbon fiber leaf springs are light in weight yet deliver a very strong response. Please buy the size that fits your current body weight with clothes. Once your units arrive, you’ll only need to reverse the calf cuffs so the buckle is in front, raise the cuffs so the top is 1” from knee cap, then use tools to secure the placement of the cuff. Make sure the cuffs’ aluminum support tubes are secure against the side of the leg, before tightening. Do not over tighten. Are Air-Trekker jumping stilts dangerous? Anything can be dangerous if used improperly. Adult Jumping Stilts are not toys, take them seriously! Just as you're not an instant Maui north shore surfer, scratch golfer, or black diamond snowboarder, you may not want to, or be able, to do back flips on your Air-Trekkers your first day! Please take the time to learn how to properly use Air-Trekkers. Learn how to walk, fall, and easily get up. Review our guide manual and the video lessons, watch other trekkers, and attend online community forums. Step by step you WILL become more confident and when used correctly, wearing jumping stilts is no more dangerous than any other extreme sport activity. They ARE a LOT more fun! To insure your safety, we insist you put on all safety gear before using your Air-Trekkers...including but not limited to helmet, knee pads, elbow pads, and wrist guards. By purchasing or using Air-Trekkers, you accept full responsibility for any and all injury and will not hold Alpine Innovations, LLC responsible. You also agree to be 18 years of age or have consent of an adult to purchase or use Air-Trekkers. Finally please know that the Air Trekkers brand of jump stilt is the only royalty paying licensee of the active USA patent. Poweriser brand is no longer active. Skyrunner, Kangaroo brands are not licensed to advertise and sell in the USA. For prompt service and assured parts supply, call Air Trekkers jumping stilts. BIONIC-LIKE DESIGN: High performance carbon fiber springs. Leg Cuff & Wide Velcro binding straps for added safety. Certification: SGS and CE. RUN, JUMP, FLIP: Run Faster Jump Higher. Try parkour, free running, and acrobatic flips & tricks. Hands free POGO STICKS on each leg! EXERCISE & FITNESS: Cardio, core body strength. Arouses athletic skills ideal for agility, coordination, balance, and explosive force. ONLY USA LICENSED BRAND: Air Trekkers brand is the only USA royalty paying licensee for German patent holder, Mr. Boeck. Quality parts and service for 11 years in the USA.